In this pAsuram, instead of the (common and specific) names which cause doubts about the identity of the person, ALavandhAr is mercifully explaining the names which are individually complete and are able to clearly identify the supremacy of emperumAn. SrIya: SrI: ka: – Who is the wealth of SrI: (SrI mahAlakshmi)? paramasathva samASraya: ka: – Who has pure goodness in him? puNdarIka nayana: ka: – Who is lotus-eyed? purushOththama: ka: – Who is known as purushOththama (best among men)? vichithra chith achith pravibhAga vruththam – having diversified categories of chEthana (sentient entities) and achEthana (insentient entities)? Who is the wealth of SrI: (SrI mahAlakshmi)? Who has pure goodness in him? Who is lotus-eyed? Who is known as purushOththama? Whose one small fraction of (thousandth of thousandth of many crores sized) vow/will sustains all of this world which is having diversified categories of chEthana (sentient entities) and achEthana (insentient entities)? ka: SrI: Sriya: – Every chEthana and achEthana other than ISvara himself is surrendered to SrI mahAlakshmi for their existence etc. Who else other than you is the refuge for such SrI mahAlakshmi for her sustenance? kim (who) – kshEpE (dismissal); i.e., there is none other than yourself. Explained in SrI sUktham 9 “ISvarIm sarvabhUthAnAm” (the goddess of all creatures), nILA sUktham, thaiththirIya samhithA 4.4.12 “asyESAnA jagathO vishNupathnI” (goddess of all, divine consort of vishNu), periya thirumozhi 7.7.1 “thiruvukkum thiruvAgiya selvA” (emperumAn who is the wealth of SrI mahAlakshmi). parama sathva samASraya: ka: – With the adjective “parama“, “parama sathva” is differentiated from rajas (passion), thamas (ignorance) and sathva (goodness) too which is read along with the other too. Who is having the forms which are the abode of pure goodness? Explained in SvEthASvathara upanishath 3.12 “mahAn prabhurvai purusha: sathvasyaisha pravarthaka:” (Oh great personality! [bhagavAn] the one who can bestow the results [of mOksham (liberation). He is the nurturer of pure goodness), purusha sUktham uththarAnuvAkam 2 “Adhithya varNam thamasa: parasthAth” (shining like sun, one who is beyond material nature). ka: puNdarIka nayana: – Who is the one who has divine eyes which reveal his supremacy, which have the satisfaction of bliss of his own experience and which highlight his compassion etc towards his devotees? Explained in chAndhOgya upanishath 1.6 and 1.7 “thasya yathA kapyAsam puNdarIkam Evam akshiNI” (The two divine eyes of SrIman nArAyaNan who is parabrahamam, resemble a lotus flower that was blossomed by morning sun’s rays), SrIvishNu purANam 1.4.26 “mahAvarAha: sputapadhmalOchana:” (bhagavAn in the form of great pig (wild boar) with blossomed lotus-eyes), jithanthE sthOthram 1 “jithanthE puNdarIkAksha” (Let the lotus-eyed lord be victorious), periya thirumozhi 7.7.9 “thAyA aLikkinRa thaN thAmaraik kaNNA!” (Oh broad-lotus-eyed lord who protects like a mother!). 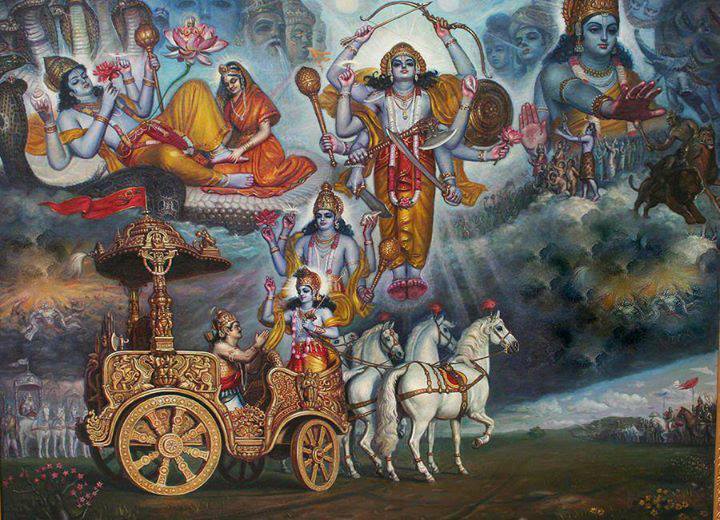 purushOththama: ka: – Who else is greater than you? Your highness, who is a trustworthy person yourself said in SrI bhagavath gIthA 15.18 “yasmAth ksharamathIthO’hamaksharAdhapi chOththama: | athO’smi lOkE vEdhE cha prathitha: purushOththama; ||” (Since I am more knowledgeable than bound soul in this world who has varying levels of knowledge and the liberated soul who is complete in knowledge, I am well-known in Sruthi and smruthi as purushOththama). kasyAyutha … – On whose minute portion, i.e., one small fraction of (thousandth of thousandth of many crores sized) vow/will, this variegated universe which has many chEthana and achEthana entities are sustained? Variegated achith (insentient entities) include ether etc. Variegated chith (sentient entities) include the four types of bodies [dhEva (celestial), manushya (human), thiryak (animal) and sthAvara (plant)] acquired by jIvAthmAs based on their karma and the aspects which are enjoyed by those four types of entities. amSam – explained as a fraction of his size; also explained in context of time – the world remaining for a small fraction of time. Explained in purusha sUktham 13 “pAdhOsya viSvA bhUthAni” (all of this material realm [which contains unlimited 14-layer universes] is quarter portion of his wealth), SrIvishNu purANam 1.9.53 “yasyAyuthAyuthAmSAmSE …” (We worship that parabrahmam on whose fraction of capacity the whole world is sustained), “mErOrivANur yasyaithath …” (this material realm for bhagavAn is like a an atom in front of huge mEru mountain), SrI bhagavath gIthA 10.42 “vishtabhyAhamitham kruthsnamEkASEna sthithO jagath” (I behold these worlds with a minute fraction of my abilities). This entry was posted in Other, sthOthra rathnam on December 25, 2016 by Sarathy Thothathri.